A simple accessory such as an eyeshadow can go a long way in defining your beauty. From neutral colours to warm skin tones, there are several varieties of eye makeup to choose from. Read this article to find out which eye shadow colour suits you the best. Learn makeup for beginners by signing up for classes. You learn the art of applying makeup like a professional and obtain inputs on queries on choosing the right eye makeup. It is recommended that you buy a colour that goes well with your eye colour. The second important factor is that your choice of eyeshadow should not be in complete contrast to your attire. It pays to buy an eyeshadow that suits the colour of your eyes and blends well with your ensemble. 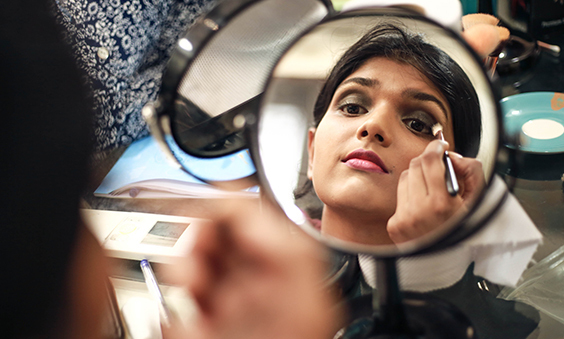 There are makeup classes for beginners that will help you learn the tricks of the trade. For instance, if you have blue or green coloured eyes, your selection of eyeshadow should include those with blue tones. A lavender shade highlights your eyes while bringing out the innate beauty. Get bold and adventurous, go for smoky eyes. Try glitter eyeshadow that will reveal the fun side of you. With hectic schedules, every woman has little time to spend time sifting through a medley of colours. Narrow your choices so you can pick up the right one based on your personal preferences. For light coloured eyes, shades of blue and purple are good choices, and light tones or dark shades compliment brown eyes. If you are few of the women blessed with brown coloured eyes, count yourself lucky. You have an endless range of colours to choose from and you can mix-and-match them for bold looks. Select an eyeshadow that highlights your beautiful eyes. They should make your peepers look darker and brighter. An espresso in a matte finish makes your eyes look brighter and dramatic for those evening party. Pair this eyeshadow with a similar shade of eyeliner for a distinct look. Fashion magazines and new articles never fail to broach on this topic: applying eye makeup and providing valuable tips for women. Here are few ideas you can implement while getting dressed for the evening. Blend the colours well–Use a base colour, followed by the main colour and then the highlighter. Start off by working on the crease of your eyes. Don’t go overboard– When applying makeup, remember simple is best. The main aim is to accentuate your lovely eyes and brighten them. Applying layers of eye shadow will not serve the purpose, and you might come across as a person with a poor sense of fashion. Dab powder before use– before you apply the eyeshadow, gently dab your eyelashes with talcum powder that acts as a base. With the right brushes and colour, you can start from the eyelid, patting the eyeshadow softly. This enables the makeup to stick to the surface giving an even appearance rather than a layered or cakey look. Ensure that you use gentle strokes and your hand does not move swiftly over the eyelids. Avoid applying the makeup all the way close to the eyebrows. This lends a smoky and a dramatic effect.